Thank you Elaine Quehl for asking me to participate in this round the world blog hop. I have never meet Elaine in person, but we were recently in a show together, called Crossing Oceans. First off just in case you don’t know, I am a quilt artist and fabric dyer. 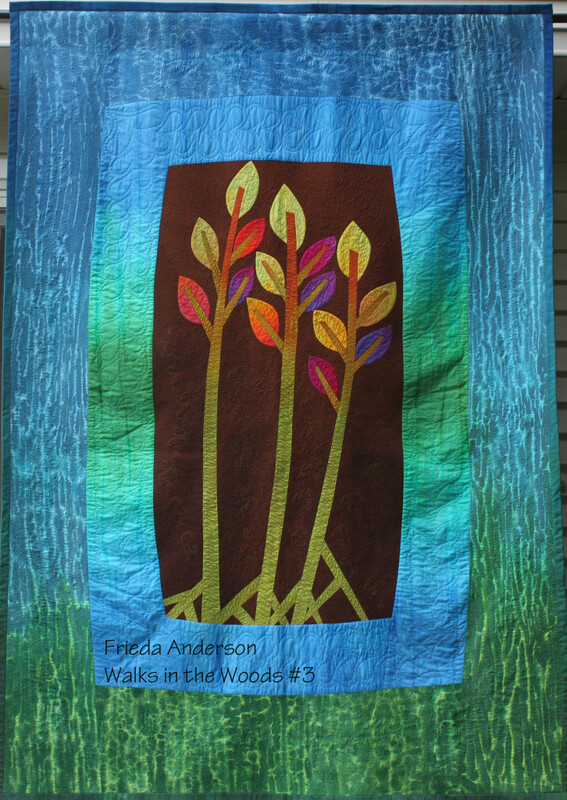 I make original art quilts, either by fusing them or piecing them. I also travel and teach these techniques around the world. It says artist on my tax return. I love that. I am ALWAYS dyeing fabric, because I sell my hand dyed fabric and I also use my fabrics when I teach my quilting techniques as well as use them in my own work. I have been dyeing my own fabric for over 30 years. AND LOVE IT! I travel and teach all over the world and have almost finished teaching for this year. 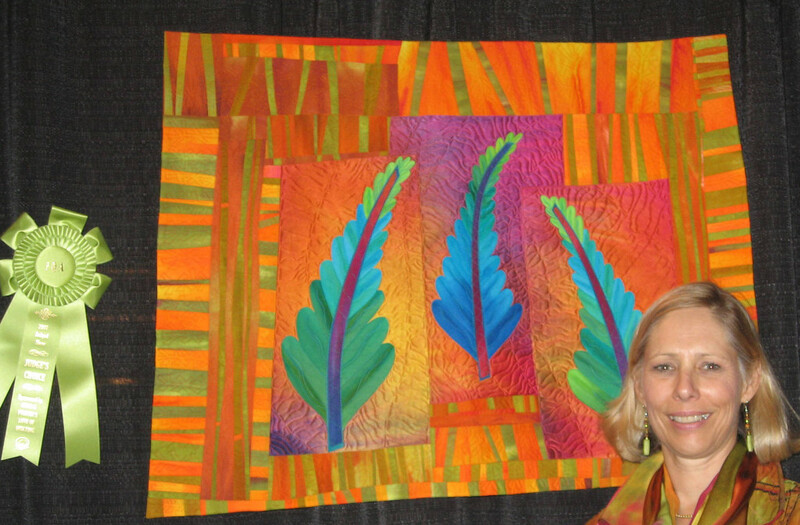 I have one more engagement in Kerrville TX, December 7-10, teaching my fusing techniques and free motion machine quilting. You can still register to come and join us. But right now I am making some personal work. I wanted to make my youngest son, Erik , a bed quilt and have just finished piecing the top of that. I am starting a baby quilt for new granddaughter who is know 7 months old. Don’t worry her other Nana is also a quilter and has already made her one quilt but of course she needs one from Grammy FiFi. 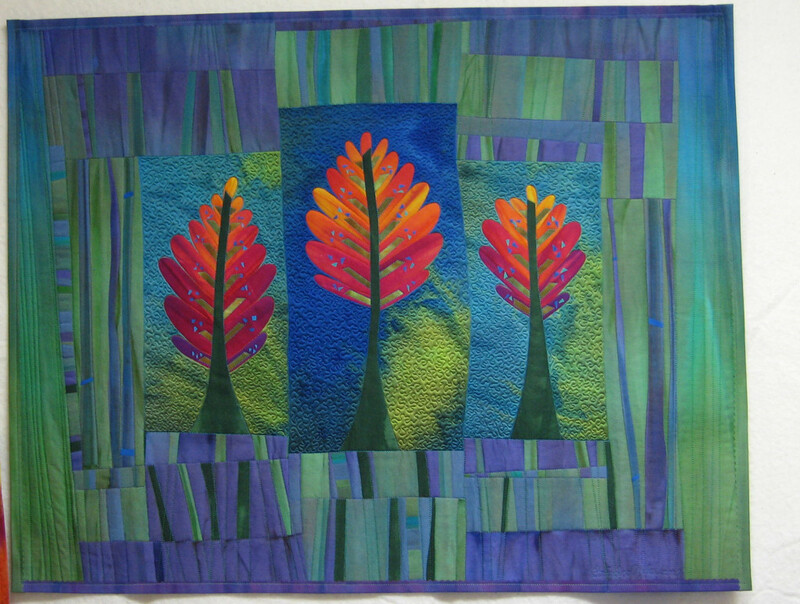 But what I am working on professionally is a large scale quilt that is a pieced version of one of my fused quilt designs. 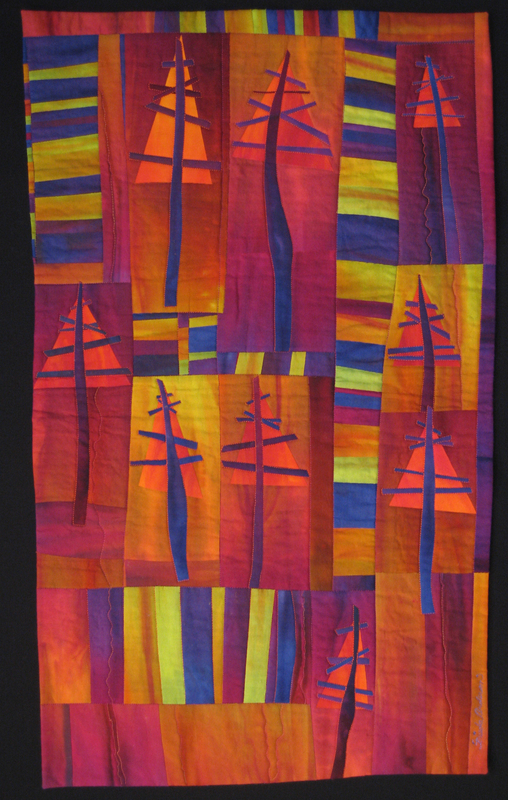 I have had this quilt on my design wall for sometime and I want to get started making it. It will take some time to get it just right. 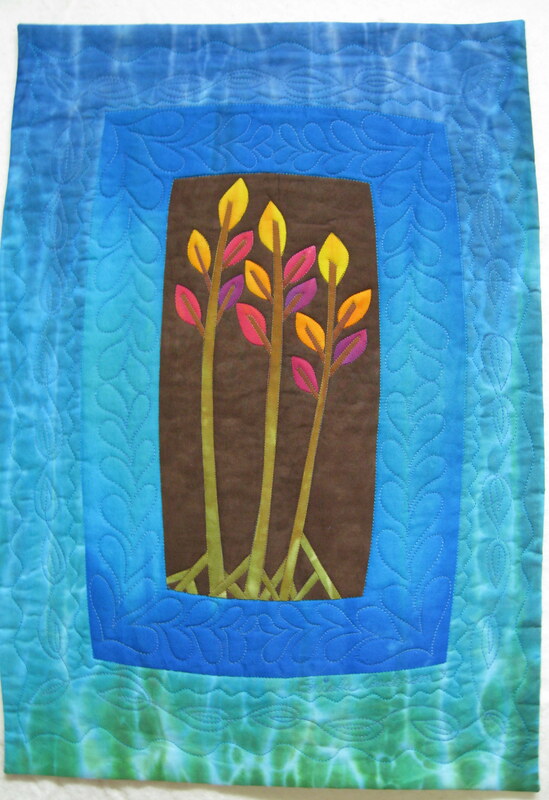 It is a quilt with stylized tree imagery and some traditional block elements. I think of it as a cross over piece. And perhaps will become a series. My work is all my own original design work and I work with all my own hand dyed cotton and silk fabric. I heavily machine quilt my pieces with cotton, silk and rayon thread. The thing that makes it different is ME I only make my own designs. Because I must. I have been making things since I was a young child and can’t imagine what I would do with myself if I didn’t create. I am always thinking about what and how I can make my next piece of art. 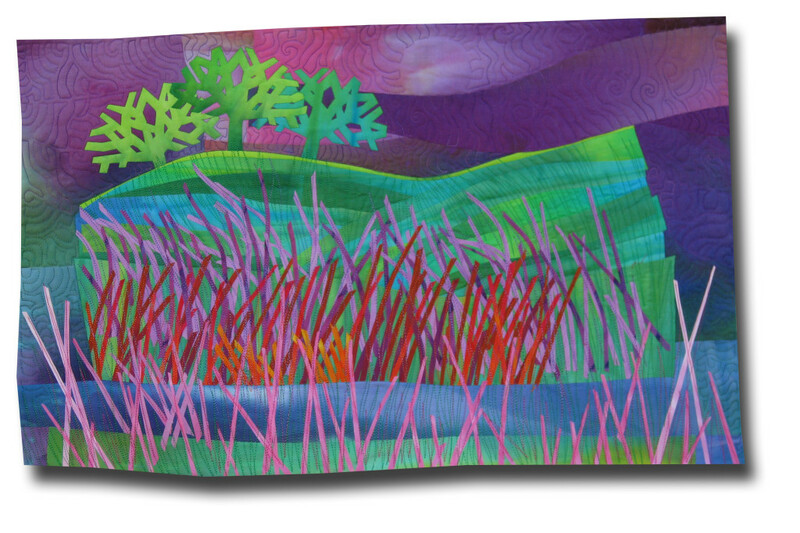 I love color and most of my work revolves around nature in some way shape or form. I am particularly attracted to trees and leaves and much of what I design is focused on that. I love the dyeing process and really enjoy seeing my fabrics emerge from the dryer. I keep a notebook and take lots of pictures of things that interest me. When I begin a new design I usually doodle sketch it in the notebook first, possibly I saw a configuration or pattern that attracted me and I jotted it down in my sketchbook or on any handy paper. If it was on a scrap of paper I make sure to put it inside my sketchbook for future reference. For large pieces the sketch is then expanded and cleaned up and sometimes scanned into a draw program (Adobe Illustrator) where I will refine it and play with color choices. Sometimes I work just from an idea and start playing around with my fabrics. This is one of my favorite ways to work on small pieces. Color wise I find that I am definitely influenced by what time of year it is and what my mood is. I love really intense color and colors that contrast. I like my work to be somewhat minimalist and not over fussy. I don’t often work in pastels, I want color and rich deep intense color in my work. I feel blessed that I am able to do what I love and make a living doing it. I love working with my own hand dyed fabric and making my own designs with fabric, batting and thread. I am happiest when a design is hemming along nicely, or I have a challenge to work out. Here are a few of my friends who I think feel the same way about their work and working. They will share with you next week November 24th on their blogs what they do and how they do it. I know you will enjoy each one of these creative artist each is a buddy and pal…. my cohort on many occasions – Laura Wasilowski. Be sure and mark your calendars so that you visit each of them on Monday November 24th, right before Thanksgiving. I Love the bright colors in your work. Your prize winner is beautiful!